Our Kitchen Renovation with Home Depot! If you’ve been following along with my Kitchen Renovation, you may recall in my last post HERE, when I showed the before photos of my kitchen. (Update: You can now also find the after photos of my finished kitchen HERE!!) At the time I was contemplating one of Home Depots services for updating my Kitchen Cabinets. 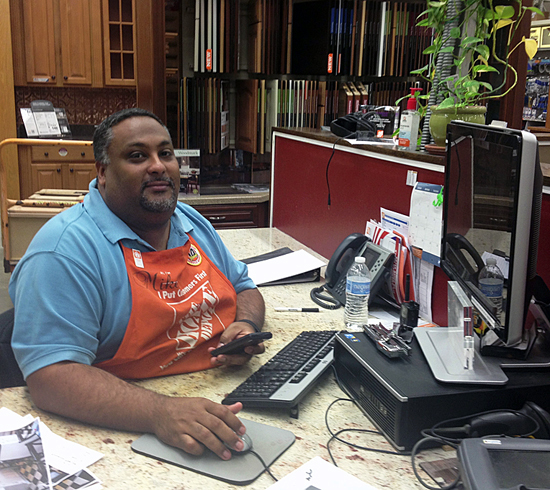 The services that Home Depot offers include Replace, Reface and Renew. With the Replace service, they remove your old cabinets and replace them with gorgeous new ones. The Reface option, works with the bones of your old cabinets and refaces them with new doors, trim, veneer etc. 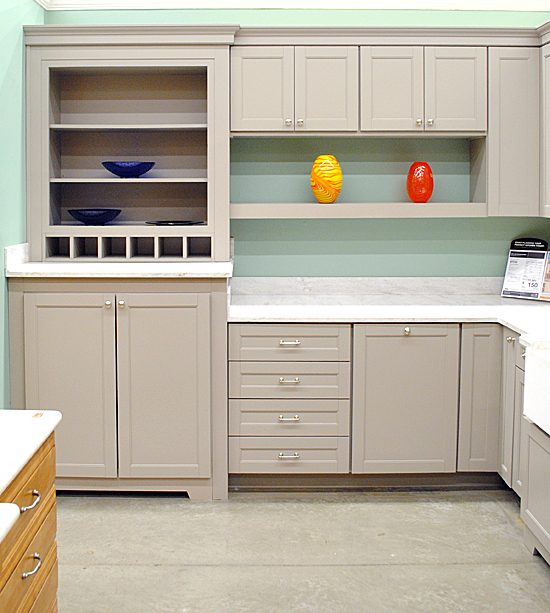 And the Renew option takes your existing cabinets and refinishes the wood. Well… I’m ridiculously excited to announce that I applied for, and have been chosen for, the Replacement option!!! Woohoo!! I’m so excited to have been selected for this, that I can’t even begin to tell you! It’s like Christmas and my Birthday all rolled up into one, and maybe a few other holidays too! I couldn’t wait to run down to my local Home Depot and pick out the gorgeous new cabinets for our kitchen! Sooo, do you want to see what I picked out?!! I had to go with the Martha Stewart cabinets … yes had to! They are gorgeous and so perfect in every way! I love the simple classic Farmhouse style of them. So timeless and elegant. I can picture displaying some of my Vintage and Antique accessories with these, like my Ironstone pieces, or transferware, or some fun old signs! Here’s another view of the display kitchen. Don’t you love walking through these and seeing all the different finishes and counter tops? I don’t think I’ve ever gone to Home Depot with out talking a little tour through the kitchen area, it just draws me in like a magnet! 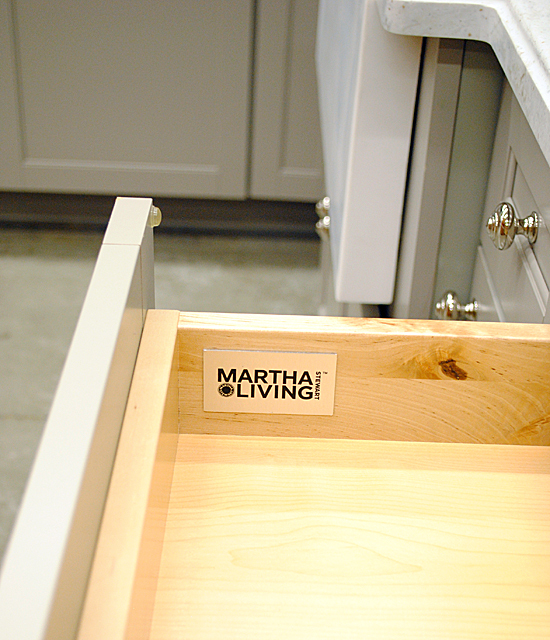 Martha even put her name in the drawers! Squee! I didn’t opt for a lot of fancy things inside of the drawers, but I did get this double trash bin, that has a spot for trash and another spot for recycling!! How handy is that?!! My husband is pretty excited about that too actually. 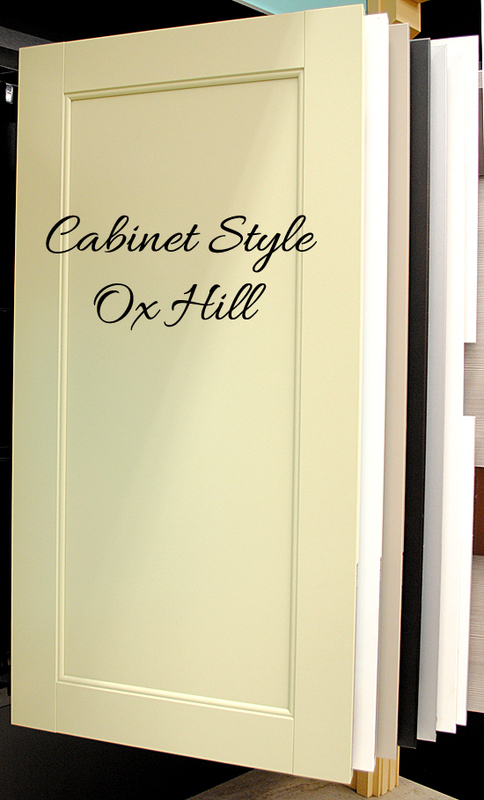 This is the style of the cabinets that we’re getting, they’re called Ox Hill. This is the color of the cabinets, it’s called Picket Fence. I picked out some Martha Stewart Hardware to go along with the cabinets. 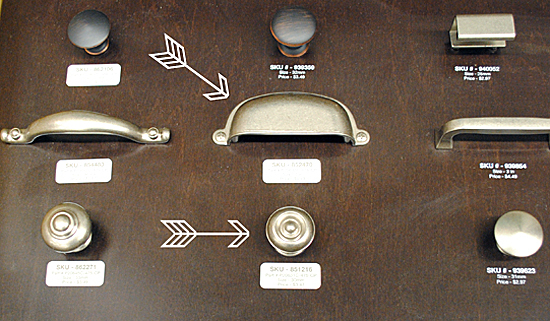 Some brushed nickel pulls and knobs. I love the Vintage Style of these! Mr. Fairy and I talked it over and we decided to go all out and get new counter tops and new flooring while we are at it! Since the Home Depot can do all of that too, it just made sense to do it all now, and have them install it all at once. We picked out black Absolute Granite for around the perimeter of the kitchen and we’re going with Silestone in Lyra for the island. I love how the Lyra looks a lot like Carrara Marble, but without all the worry, that you get with real marble. This is our flooring. It’s the same wood floor that we have in our Dining Room, Living Room and Foyer, we decided to extend it into the Kitchen and Laundry Room. The color is called Saddle, it’s a rich dark brown Hardwood flooring. If you’ve ever wondered about the process of having a Kitchen Remodel done, I would highly recommend making an appointment to meet with one of Home Depot’s expert Kitchen Designers. 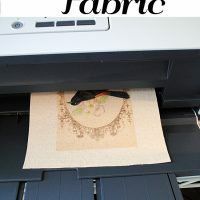 It’s free and such a fun process! This is Mike, he helped me to design my kitchen. I just brought in my measurements, and some pictures of my existing kitchen, picked out my cabinets and he worked his magic to create the perfect Kitchen for our home! Here’s a little peak at his computer. Yes, I’m nosy! I had to check out the program, it was so cool! Mike has been designing kitchen’s for years, he loves his job and he’s won awards for Designer Excellence, so I knew I was in good hands! At the end of the appointment, you get a print out of your new Kitchen to take home with you. Yay! And if you decide to proceed with the Renovation, you can have them come out to your home to take the official measurements. There is a $100 fee for that, but you get that back if you give the go ahead to get the work done. Once the measurements are done, they are sent to your kitchen designer and he makes any adjustments to make sure everything will fit just right! Want more info? Check out these videos from The Home Depot: Replace Video, Reface Video, Renew Video. Well they will be starting on my Kitchen Renovation soon, I can’t wait to share the photos with you guys when it’s all done, maybe I’ll share a few in- process photos too! Now for the Giveaway! I would love to know what words describe your favorite Kitchen Style. Do you like sleek and contemporary, Warm Wood tones, French Country etc.? Let me know in the comments section below for your chance to win a $1,000 Home Depot gift card! Congrats on your new kitchen! How EXCITING!!! I must be a warm, woodsy, kitchen type. We had a kitchen in our old house that had warm wooden cabinets, paneled walls and green counters and I just LOVED it. My house now has white counters and floor and it seems so cold and unfriendly. I could find a good use for the gift card, I’m sure!! Organized, storage, clean with French country charm. I am looking forward to seeing the finished results and how the process works! I love industrial eclectic! I just painted my kitchen cupboard dark grey on bottom and a winter white on top. I’m fixing it up bit by bit! A new kitchen – so exciting! I am not unhappy with my cabinetry, but would love to replace the formica countertops with a solid surface. I would classify my style as traditional! Cottage with a hint of France! Are you getting that big farmhouse sink? I would love one of those instead of my stainless steel. Great giveaway! I think I could do some real damage in Home Depot with $1000!! Everything looks good to me! I have an outdated 80’s style kitchen with big tiles and fat grout-boy what $1000 bucks would do to push out some old looks and refresh! love the cottage look, I love cozy, eclectic, everything you do i LOVE! I would put in new flooring/countertops if I would be so lucky to win. We shop Home Depot alot, they give a military discount, bless their hearts! thanks for the opportunity! I love warm wood tones and old American country style…shaker style cabinets, wide plank flooring, black cast iron hardware. What a fantastic giveaway! Thanks for the chance to win. I love classic with french and contemporary touches. All your selections are just beautiful. I wish you happiness and patience while all the transformation is taking place. And thank you for the opportunity for the giveaway! Since we downsized a year ago, we could use more storage space, or at least better organization tools and Home Depot has everything we would need. I love country, French country styles. And I really like what you have chosen and the colors! I can picture this setting against a pale warm yellow. I am needing to paint my kitchen which is all dark paneling at present. The cupboards are pretty though. I like Arts and Crafts style for woodwork, but with more color added in tiles and accent pieces. And colorful curtains! I am just in the process of trying to update my kitchen and it looks like you and I have got very much the same taste – The cabinets and colors are exactly as I have picked. Good luck, Merry Christmas and Happy Birthday! Warm, rich, modern and most importantly spacious. When we renovated our kitchen, we wanted something spacious enough so that when the kids went from 3 years old to 17 years old, we would ALL be able to fit in the kitchen at the same time; while still opening the fridge, oven, cabinets or dishwasher. Have fun designing! We renovated our kitchen a few years ago but had to keep our old oak cabinets with the curvy top of the doors. I would like to replace the doors with something simpler, like yours. We used nickel hardware and black granite on the perimeter cabinets and a butcher block topped island. The backslash is the small black and clear mini tiles as an accent for the tan larger tiles. It turned out great except for the doors, as mentioned. The best part…we did it all ourselves. We are know getting ready to update our bathrooms. Would love the Home Depot gift for that!!!! I like what you picked for your kitchen…it will be beautiful. Sometimes, just changing the hardware can jazz up a kitchen! It really depends on the house and the lighting. In homes with open kitchens with lots of natural light, I prefer bright kitchens with white painted cabinets. In darker ones, I prefer Tuscan–beige and brown tiles, bricks, pale woods, etc. Whatever the type, I need LOTS of storage, preferably low storage as I’m Hobbit-sized and often have to climb my kitchen counters to reach the top shelves in the cabinets. I have been remodeling my older kitchen mostly by myself since March this year. I have been posting about it on my blog. If you are curious, you are invited to drop by and see the 23 posts so far at http://lynettesphotoart.blogspot.com . I still have a long way to go and need a new floor too The one you featured is PERFECT! Positively droolsome! My daughter put a hardwood floor in her kitchen while rebuilding from the 2011 tornado and it is amazing! Thanks for the opportunity for the drawing. It sure would be a blessing. I’m so excited for you. I’d have to describe my kitchen style as country farmhouse. However, my kitchen is far from that! Sure could use an extra $1000 to help make that happen!! How LOVELY! Your new kitchen looks very exciting. My small kitchen has the worst cabinets. They are so tiny, and the shelves are not adjustable. I cannot put a box of cereal or a bottle of oil in the cabinets and it drives me nutty. Because my kitchen is so small, I often wonder what would work to make it look larger. I am not certain what the style is called, but I would go for light, and probably glass doors if I could get them. I love the French Country look with a little Cottage thrown in. A nice farmhouse sink and your beautiful wood floors would be exactly what I would like. Thanks for the opportunity to win! 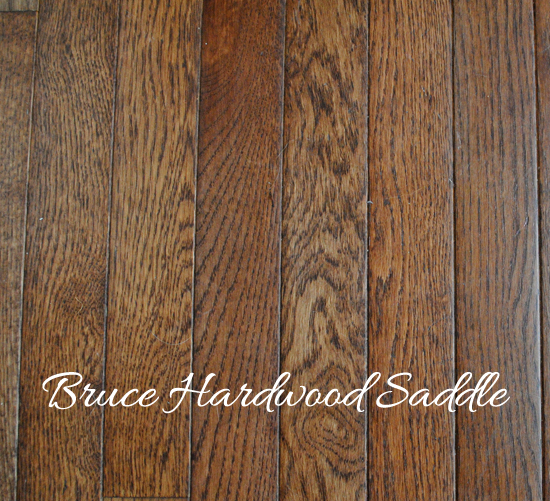 Bruce Hardwood in Saddle! I think it is what is in our house. Let me know how your kitchen upkeep goes because I would love to extend it into our kitchen. Right now hubby says that I spill too much water and the flooring would not hold up. I can’t wait to see your new kitchen.I love the style of cabinets you choose. It will be so beautiful! My dream kitchen would have light cabinets with warm wooden floors. Lots and lots of natural light and all the extras for the drawers and cabinets! I love white cabinets but not too sure how logical it would be in my kitchen though (my husband does a lot of cooking) (he is kinda messy). I also love red accents with a little blue thrown in with it. I do love the option that you got with the garbage and recycling containers. And I would also LOVE the gift card! We live in an old house that could use a $100 worth of love in the kitchen. I like a modern style kitchen with a clean look. I dream about having pro appliances someday, as well as a counter top space for mixer, blender, food processor etc. My real must have is a warm kitchen floor in look and most importantly in feel. I love the wood you picked out, excellent choice! 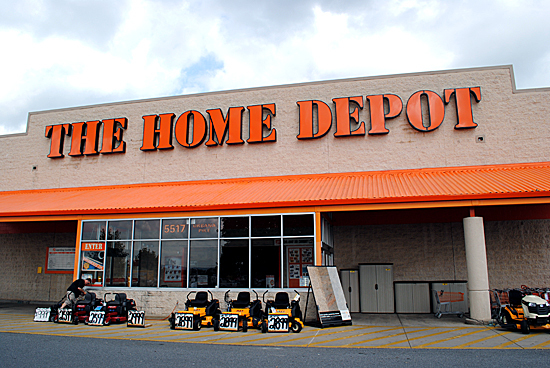 We’ve purchased so many items from Home Depot over the years. Their quality and service are second-to-none. Good luck with your remodel! I do like your choice of cabinets. Should never go out of style and now that kitchen can be so easily accessorized/decorated to change with you! I need a top to bottom (me and my kitchen!) makeover. I could live with my cabinets but need new hardware and have never even had a backsplash. I would love a backsplash! New flooring…no question about that!! I love your choices and am waiting to see the finished kitchen. I love Old World with it’s dark cabinets. My kitchen is aimed to feel cozy with an Italian/Sicilian flair to honor my grandparents. Isn’t it fun decorating? Love Martha, I have a complete studio set- up of hers. She is the queen of organization. Would love a kitchen like yours. I’m, jealous !!! Congratulations on your gorgeous new kitchen!!! It looks like it will be easy to take care of. Just lovely!!! I really need to do the same. I have been thinking about black cabinets. My kitchen is very light and less than half of it is cabinets. I love the look of stone floors and with all this, a lighter counter top might be best. Nice! I love the cabinet door style you picked. I’d have to say “my style” of kitchen is simple traditional. Especially for cabinets. I’d go with quality pieces that can look good with multiple colors/styles of wall/decor. Mainly because living in the same house with a kitchen redo is my least favorite thing in the entire world. Have fun with your new kitchen, can’t wait to see it!! I love the farmhouse look, would love to have my kitchen updated. Thank for the chance. My favorite Kitchen Style is sleek and contemporary, I am hoping a kitchen makeover soon. I think I would describe my dream kitchen as Storybook Country Cottage. I’m working on it, but would love a new farmhouse sink like yours! I waffle between the black counters like you chose and some kind of white counter top. I find an all white kitchen so appealing (thats what I have now) because it allows me to change up the colors each season. But the contrast of the black or a dark gray against my cottage beaded board cabinets seems like that could make me happy as well. But anything has got to be better than the cracked and broken 1960’s tile that now adorns my kitchen. Thank you Graphics Fairy and Home Depot for this opportunity! Pretty cool! Can’t wait to see the finished product. I hope you show “in progress” photos. Not so much fun for you but great for us! I love the French Country look. Congratulations on your new kitchen. The cabinets, hardware, and flooring you’ve picked out are gorgeous! Love your choices. I like more of a country/farmhouse style. I would love some white cabinets with a great hardwood floor. I love rich traditional kitchens but the bright white cabinets you chose are fresh and timeless. So if I remodeled it would be tough to pick the the direction! Although I am loving the mix of painted and wood I am seeing lately. Maybe if I win this gift card I will consider that remodel I have been dreaming of! I am so happy for you winning such a wonderful giveaway!!! You are one lucky ducky!!!! I would do mine in Shabby Chic with ivory, mint, baby pink, and lavender!!!!! I love the shabby theme and should have been born years ago when it was the style!! I also love the Edwardian style also oh and the painting!!!!!!! Wow!!! Best of luck everyone on winning!! I love country, farmhouse and French country. Your choices are awesome! Exciting! Can’t wait to see your new kitchen once it’s installed. I love a white kitchen and lately I’ve been falling in love with the country farmhouse style. I love the crisp, clean look of white and all the interesting vintage details that are so popular with this style. I would love to renovate my lake house kitchen. I’d like my island to have painted bead board with a butcher block counter. I guess that sounds beachy? Love your choices and can’t wait to see the finished product! I’d enjoy something a little less edgy than the Martha Stewart style you picked out, but I do like the hardware you selected. Thanks for the opportunity to participate in the giveaway and congrats on your new kitchen. What a score! I love the farmhouse look with lots of French influences. I have started some boards on Pinterest with things I drool over until I can “get ‘er done!”….lol….cozy, warm, inviting, and fun with a few touches of whimsey here and there. Can hardly wait to see tyour finished product! I love your new kitchen….whatever style it is, that’s what I like. Plain, as in not fussy, but beautiful. A great backdrop to pretty things. Must be easy to clean and welcoming to family. Thanks for sharing with your followers. I needed a bit of inspiration to get my wheels turning. Looking forward to see the before and after shots! We used Home Depot for our last kitchen in our previous home although hubby and son-in-law installed them. They were beautiful and the selection and ordering process went great, no problems at all! I would use them again and one day hope with the current old kitchen we now have. I love your choices and would love to do something with my 70’s kitchen. We just purchased the home this summer and and it felt like home instantly. It has great bones but could definitely use some updating. I’m ready to roll up my sleeves and start changing it up but we can only afford to do a little at a time….so baby steps and little changes here and there. I think my kitchen style would be eclectic farmhouse. I love the warm family feeling you get from the farmhouse style but I do like a little quirky unexpected thrown in. Lucky you!! My dream kitchen would have soapstone counters,wood floors that were rescued from a very old house, custom made cherry cabinets inset with rain glass, lots of windows & a fireplace with a raised hearth & huge mantel. Not any 1 style, very eclectic, filled with things I love. Since I have an 80’s mauve kitchen now (yes, it’s bad) anything would be an improvement! My dream would be a slightly dressed up shabby chic version with soft white cabinets, black counter top with an island in reverse color order. French Country does it for me. But that Farmhouse look is great too. It’s almost a toss up. I am fond of a warm and light-filled kitchen. It’s the heart of a home and it must be welcoming. Nothing too modern for me! I like the cabinets you chose. Love the warmth and cozy look of French Country with rich hardwoods throughout. Needing some countertops and a farmhouse sink, this giveaway would make this possible! I love the beautiful gray color of your cabinets and the black granite counter top. So warm and inviting! Right now I have dark cherry wood cabinets. But I’m loving the gray color cabinets that you chose. Mine is Americana style. Red, white and blue. Love to cook so the kitchen is a much used locale. Can’t wait to see your new kitchen. My style seems to be more towards warm contemporary. Yeah on the kitchen! Congrats! And, while I am thinking about it, thank you for all the graphics I have downloaded, from you, but never stopped to say thanks. Big thanks for all of those! My favorite kitchen style? We live in a cottage, so cottage style, with lots of personal touches, but not messy. Because we live in a cottage, everything must be worth the space it uses. And as long as it has soft, but clean, lines, I am happy. I already love my kitchen, but since it is now 70 years old, it needs some help. I am like some of the other, that farm house sink looks awesome! I love the homey comfort of the Farmhouse look… I’m a city girl now , but I was raised on a farm, and this style resonates with me. Your kitchen choices are gorgeous! Glad you are getting a new kitchen. I love the French Country look and would love to do a new kitchen like that. My kitchen cabinets were built in my house 35 years ago, stained walnut, and have held up beautifully through 2 floors, 2 counter tops, and 3 wallpapers! I think the Home Depot refinish option would be good for me, but I also would love some updates like the trashcan caddy and large storage drawers. Love the cabinets you picked and am hoping for my “redo” soon. love your new choices. i’m a traditional gal. like oak. I just love French Country style. It’s relaxed, warm and cozy! My kitchen is Old World, but I also love French Country. I loooove the farm house look! Relaxed and easy! I like light, airy kitchens with windows for natural light, some openn shelving, and pops of color with light or white cabinets. Something with a cottage feel. My choice would be French country, bright, cheery and colorful with absolutely, positively NO stainless!!! Love your new kitchen prospects!! I would love to at least get new doors for our cabinets. They are very old, but real wood. I would go for a simple style that would go well with country (but not rustic) styling. Texas farmhouse / French country….a bit eclectic! Looking forward to seeing how your kitchen turns out! I am so excited for you… and thrilled with the scoop on the Silestone. I’ve wanted Carrara marble forever, but was concerned about the maintenance. I’ll be popping by Home Depot to check on the Silestone ASAP! Can’t wait to see the finished work. I’ll bet you can barely sleep… A WHOLE new room! Love it all…this would be a perfect fit for my kitchen! Congrats on a job well done! 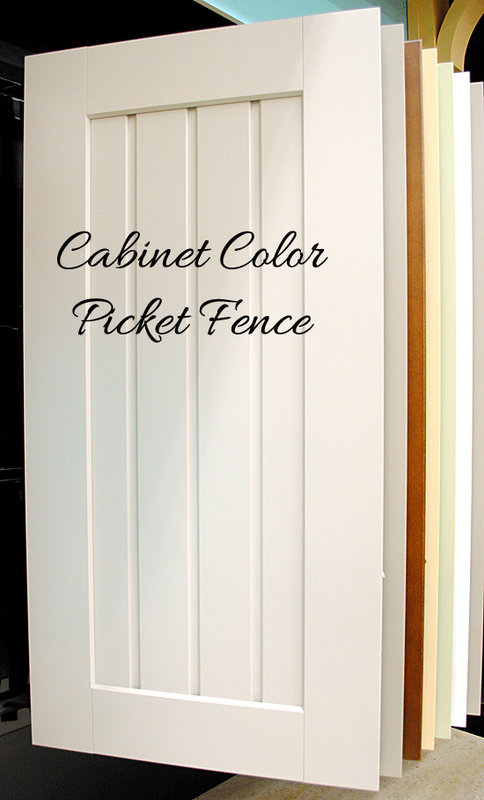 I love the style of cabinets that you showed with the color Picket Fence. My kitchen is a bit sad and is over 50 years old so a Reface project would be the least intrusive for me. I like to keep it a bit retro looking so I guess that is French Country (?) Love your website and the free graphics for everyone! I love warm, wood tones. An Early American kitchen would be my choice. I’m a French country type girl. I’d get rid of my hard-to-reach overhead cabinets entirely. The lower cabinets I’d love to have with sliding drawers and pull-out racks, which would make accessing the lower storage a lot easier for us because of disability issues. On another wall I’d have pantry shelves, pegboard, and shallow lower cabinetry– all behind floor-to-ceiling sliding doors. All would have a white painted finish, smooth and sleek. Then I’d hang some of my blue and white china collection and have some cherry red accents to make everything pop! Would love to win that gift card. It would be a big help. Thanks for the giveaway opportunity, and CONGRATULATIONS on your wonderful new kitchen. What you chose is gorgeous! Very white, bright shabby chic! No modern look for me! Love the kitchen style! My dream kitchen is light colored cabinets and a lot of cupboard space that makes organizing easy! my style is recycled industrial steampunk vegetarian with lots of white and blue… that and with all aspects environmentally responsible, which eliminates plastic and other synthetic products. Counters would be concrete or cutting board or bamboo or paperstone… You sound excited about your renovations… so many possible directions to explore! Congrats on the new kitchen!! I would love to re-do ours, I like a farmhouse type look personally! Love, love, love the look of your new Martha Stewart kitchen!! Thanks for sharing!! Especially love the open cabinet shelves because you can show off wonderful pieces there!! Is that a wine bottle holder under the open shelves? What a great idea! My kitchen is very small but just recently added a couple more cabinets against an open wall for extra storage. Since I’m retired and have little extra money, would love to win the Home Depot surprise to redo my kitchen floor since it’s the original linoleum from the early 60’s!! rustic farmhouse style for sure! I love sleek wood cabinets with lots of specific storage–tray files, spice and knife drawers, etc. I want nothing that can’t be easily cleaned, pot drawers, all in one faucets, some open shelving, wild granite and wood floors. Home Depot, here I come! My current kitchen is dark cherry and somewhat contemporary, but I actually wish the lines were even simpler than they already are and that the cupboards were much lighter in color! Congrats on your dream kitchen!. Mine would be French Country Farmhouse with a touch of GLAM. We have had “primitive” for years and I need bright vibrant colors instead of dark and drab! You convinced me to get over to Home Depot. I like the warm and cozy kitchen. I need new counter tops and I have lots of counter space. I am glad that they have Silestone. Your kitchen is going to look so great!! So exciting!!! My favorite kitchen style would be a combination of french country and old english farmhouse. I love rustic, vintage, and quirky touches that have character. White or cream cabinets with wood floors, wooden beams, a farmhouse sink, and rustic touches throughout the space. A combination of rustic and feminine, old and new :). 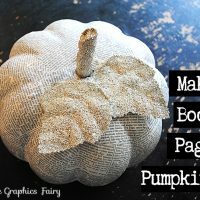 I am a huge diy person so of course it would be filled with tons of my own creations! I love your website and I can’t wait to see how the kitchen makeover goes!!! Looks great! I love modern looking kitchens but with warm touches. Good luck on your remodeling! I would love to have a farmhouse kitchen with distressed black cabinets and granite countertops..an island in the middle with plenty of room to cook with my daughter, and roll out drawers for all of our pots and pans. Awesome! I love your cabinets and all the hardware. I would like white cabinets in my kitchen because it is so dark the way it is. Congratulations on your new kitchen, how exciting. My perfect kitchen would NOT be a galley kitchen. It would be open concept and I would love to have more prep space and bigger deeper cabinets. Granite countertops would be nice. I think I would also like glass in the cabinets or at least one cabinet to display my special bowls and things. First of all, congratulations!! Your choices are amazing! Exactly what I would have chosen. My kitchen style – country elegance (hmm, is that a category?). It’s an old kitchen from the 70’s that I recently refinished in Old White, oiled bronze knobs and a distressed finish. Lots of old things I’ve added along the way to create some ambience. Need a new counter though, so $1000 from HD would go a long way towards that! I love your choices. I like a very warm, relaxed look. Maybe something that reminds you of being in a cabin. Also, I adore French Country, but in a relaxed way. Love what you picked for your kitchen…can’t wait to see it finised. I have been thinking of remoldeling my kitchen you have inspired me to go to Home Depot and talk to them….I think I would like traditional style….. I like a big country kitchen! My living room, dining room and kitchen are all one big room. That way when I am cooking, no one can talk about me behind my back! Your chosen cabinets are gorgeous!! My fave color and hardware too. I love the antique/vintage look. But I have learned to be practical when it comes to the kitchen. Smooth lines, less detail an darker colors mean less work for cleanup. I am all for that! I love that countertop color. That’s the first time I’ve seen that. If you have any extra ship it to me please. Karen all your picks are beautiful!!! see more of your decor soon! Bravo on the new kitchen, especially love the spaces where you will display your collection of pottery and transfer ware! Love those nooks;and so very practical! I make kiln formed glassworks and would live to have nooks to display in the kitchen;) and I love your color choices as well! Worked with Home Depot in another kitchen remodel/replace in an 1907 house. They were so helpful. Now, we could use updating in this 70’s kitchen. I know i love pullouts in a double lower cupboard for bowls, and plastic containers! The style probably as plain as can be for easier wiping down to clean. Counter tops high quality Formica or ceramic tile – we have ceramic tile now and it is a breeze to keep clean and no burns from hot stuff. No doubt I can go way over the gift card amount! I love your choices. I love French country but I’m afraid my kitchen might be too small. My husband says next summer! I hope s! What beautiful cabinets….love them…..I love French country and love the flooring that you picked out…thanks for the giveaway…. French Country but I do love warm wood. Beige, rust, yellow, and some blues! Lucky you! If I could start over my kitchen would be Modern Industrial….. Red, Black & Stainless with lots of accessories at which point it would not look so modern. Anyway, congratulations on your new kitchen. Happy Trails! Your kitchen is looking gorgeous! I love the sink – that is where I would start with mine. I’d want a large old-fashioned farmhouse sink, field-stone counter-tops (i think that is what they are called – saw them installed on a This Old House episode), white or soft robin egg blue cabinets (maybe a combination of them) in traditional/cottage style – love the look of bead-board, white appliances plenty of light, and most definitely a wall-oven! More or less, an eclectic mix. Can’t wait to see how your kitchen comes together. Oh, I would love to have my kitchen redone!!!!. My cabinets are 35 years old and a mess. We have been doing it ourselves a little at a time and put the cabinets and counters last on the list since they function even if they are horrible. I want a white country kitchen. I love how clean white looks and how fresh it makes everything feel. With blue and yellow accents. I like two styles of kitchen French country and Italian Tuscan They have some similarities which I really love. Cabinet doors with glass, warm colors, ivory, browns with hints of red and green. I love the warm woods. Not a very modern person. LOL Would love to win the gift card! Must say I love all the graphics you share! French Country, farm house, warm tones….everything for me but modern!!! Your new kitchen will be lovely. I did want to share one thing…when I remodeled I had new cabinets so lost my white solid surface countertops with integrated sink. I replaced them with the exact black granite you have chosen. The granite is nice and the couple of seams are in non noticable areas, but I miss the look, feel and seamlessness of my solid surface counters with sink. I wish I had gone with black in the solid surface…but granite was all the rage and I got sucked in. Again, they look very nice and everyone else likes them, but….so just give it a second thought! french country with some rustic country mixed in. Think that is doable? Karen, your kitchen is going to be dreamy! I love all the components that you’ve picked. Our kitchen is very old and small and we’re hoping to renovate it soon. My style is definitely cottage with open shelving, little cubbies, etc. along with all the modern conveniences! Have the 80’s golden oak cabinets, but still love the warmth of them – wish the doors had the simpler frame though. Still nothing inspires me to paint them especially since we are blessed with many for good storage quantity. Would love to add some helpful inside things like slides & dividers & new countertops. Many of the granite colors just do not mesh with my overall style of decoration eclectic/traditional with regional, family, & found items – love crocks, enamel ware & pottery, vintage & local potters in the kitchen & both family & found furniture pieces all over the house. Probably too cluttered for some, but I like it. Bright material, with soft raspberry & blue walls in the kitchen & blended colors in the rest of the downstairs. When we first moved in I painted the kitchen walls a conservative beige – hated it – too bland. Do not know how people live with the all ‘beige house in order to make it look sellable to the masses! Give me color & personality. A kitchen that is #1- organized!! #2- white!! #3-clean!! Sounds like a happy kitchen to me! Your new kitchen it gorgeous!! Love what you picked out! Congratulations, what beautiful choices you have made. I would love cabinets with frosted glass fronts and a granite counter top. wow… beautiful kitchen! I would L>>>O>>>V>>>E a Home Depot gift card to do some much needed home improvement. go me! Judging by the number of responses ….looks like everyone needs a new kitchen. We have gutted one wall in our kitchen….hopefully will have it completed before Christmas….the 1960’s white laminate needs to go…make room for French Country…or at this stage ANYTHING would look better than what we had. Martha Stewart cabinets would be a option….Your kitchen looks great! I like neutral colors-you can always change a pop of color with accessories….Thanks for the opportunity to improve! Love the cabinets you picked! Warm woodtones are my favorite!! But classic Farmhouse runs a close second! Love it! Love it! Your choices would be mine as well. 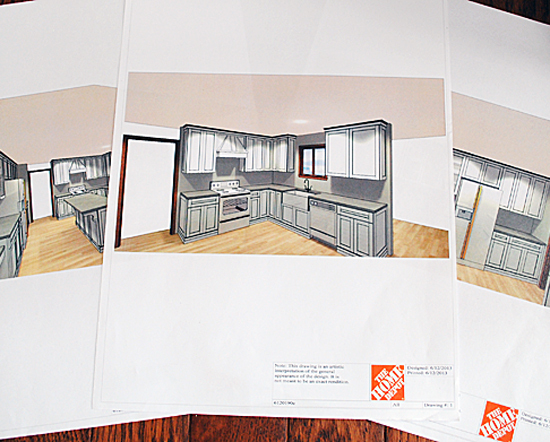 My winter project plans are to paint my kitchen cabinets……..unless I find myself with a $1000.00 Home Depot gift card. Then I would just have them refaced. The winters are long here in Minnesota, but I have a lot of other projects to do other than painting cabinets! My style choice is French Country Farmhouse, which I define as a little elegance, a little shabby, and a little country. It’s the combination of comfort and elegance I love. I really like my darker wood cabinets with nickel hardware. That’s what they were when we moved into this house a year ago and I am happy with them. I guess my style would be “simple traditional” with a leaning toward country. Happy for you to get to do the whole kitchen…sounds like a fun process! I was just telling DH I’d love a chance to start over and make the choices for furnishing and decorating our space! 🙂 My personal kitchen style would be more country kitchen I think. I love the look of wood! Hugs! Thanks for the chance to win! We are in the process in the planning stage of doing a bathroom remodel and a kitchen update. We are planning to refinish the cabinets, with a few modifications. I want to change out one lower cabinet to a trash/recycle cabinet if possible, add new granite or quartz counters and a new back splash. We are planning to the bathroom first. Starting with pulling out the gigantic jetted tub. We want a new vanity, new lighting and fixtures, relocate the toilet and have a true water closet if we can put it into our budget and finally a walk in shower. We could really use the $1000 winnings to help with these projects. I could live in the Home Depot Kitchen Display! A new kitchen each day of the week. Your choices look great same as I would pick I am sure! Enjoy!!! P.s. how do you get a kitchen fairy???? I love the warmth of the darker woods. I lived in a house with white everything for so long I couldn’t stand it any longer. Too sterile for me–esp since I worked in a hospital!! I would love to have either granite or quartz countertops instead of the yucky pink stuff we have now. And glass mosaic tile for the backsplash. I’m going with cottage style in my house. It seems to be appropriate for the style and age of the house. I absolutely love, love,love everything you have chosen. I have always wanted white cupboards. I have knotty alder which are very pretty and I have lots of them, but I think I have way too much wood in my house with shutters, blinds, doors, cupboards, etc. So have been adding painted wood furniture whenever I can. Now my dream kitchen will be from the Home Depot. Thanks so much for your inspiring inspiration! hhhhmmmm — not sure what my style kitchen is called. It’s creamy white cabinets around the perimeter with a dark island, over sized handles on the doors and drawers, wood floors, stainless appliances — I just really love it!! I LOVE THE VINTAGE COUNTRY STYLE OF KITCHEN OF KITCHEN, WITH THE WARM BROWN HARDWOODS AND THE ANTIQUE STYLE HARDWARE. THE WHITE CABINETRY AND THE TIN CEILINGS. ALSO THE BIG COUNTRY SINK. THIS IS WHAT I WOULD LOVE TO HAVE DONE FOR MY MOTHER WHO HAS SACRAFICED EVERYTHING ALL HER LIFE TO TAKE CARE OF OTHERS AND NOW AT 75 YRS OLD CAN NO LONGER AFFORD HER DREAM KITCHEN. I love a farmhouse kitchen. Mine is currently a 1980’s with pink (yes pink) countertops. I LOVE French Country with all the warm colors with roosters everywhere and little ladies picking flowers. Hi…love all your choices.!! if I had to describe my look it would be..shabby chic washes over Nantucket…I love the look of the cabinets with feet..I really like that Lyra you picked..my friend had a Silestone that was black with a silver fleck..it was really nice too..I’m into glass tiles..altho I do really like the small subway that looks like marble…my kitchen is in an area that doesn’t get a lot of natural light so I’m planning to use a nice yellow and glass to help brighten it up..at least that’s the plan..look forward to seeing your finished kitchen.! Oh, your kitchen will be fabulous. Guess I would call my dream kitchen “eclectic farmhouse”. 2 words for my dream style; Country fresh! Love your choices,, I love the timeless look of simple painted cabinets, medium dark hardwood and simple plain counters: TIMELESS! We remodeled our kitchen a couple years ago using dark shaker style cabinets, black quartz counters, and tan and black basket weave tile backsplash. I am so pleased with it. Wish I hadn’t let the cabinet guy talk me out of the matching wood door for the refrigerator, but everything else is great. ; Look forward to seing your new kitchen. Congrats on your kitchen..a lot of work and excitement! Enjoy! My favorite kitchen style in a combination of warm French Country with Shabby Chic. Warm granite counter top, energy efficient appliances and uncomplicated functional storage using a lot of drawers to organize cookware and appliances. The gas range/oven needs to be a stylish professional gourmet size and quality to satisfy my fondness of cooking for the people I love! Nice job on the remodel I am a definite French Country! I have a 1994 doublewide trailor. so I have the smallest ugliest kitchen ever! Wow ! WHAT i COULD DO WITH THIS PRIZE!!! Oh Karen, I love the choice for your new kitchen! I love the Farmhouse look too and have tried to bring it to my little kitchen! After the holidays we are planning to expand our kitchen and a Home Depot gift card would be a great way to start the new year! I’ll be keeping my fingers crossed, thanks for the chance!! I love all things vintage with a farmhouse feel. An apron front sink, with white cabinets and glass inserts, durable granite with the look of marble, and raised countertop heights since I am tall, really help too! Oh my what a wonderfully warm French Country kitchen. I am not familiar with the Martha Stewar line of cabinets but they are so clean and sleak and just what I am looking for to update my 1970’s avacado green kitchen. We bought this house because it is handicap accessible and are in the middle of a bathroom remodel. The next project is the kitchen. I am disabled so we had to update the bathroom to accommodate my needs. Husband is very handy and I love his work but . . .
My style of kitchen is cottage. With white cabinets and a farmhouse sink like you have.At least that is what I thought I wanted until I saw your cabinets. Love them! Congrats on your new kitchen!! I love French County with light warm wood tones and raised height on the counter-tops. Our home was the builder’s first and he put the cupboards in wrong so there is a lot of wasted space. So I could do a lot if I win the prize! Thanks for the opportunity to win! Wow, congrats! Your kitchen’s going to be beautiful! you deserve to get this big treat since you so generously share with all of us! I love the farmhouse look, with a chandelier for a touch of fancy! Love just wandering the aisles of HD & thinking of what my next project should be! Would be awesome to win a gift card! Thanks! Wow! Hang on you’re in for a ride! Can’t wait for the before and in the process photos. My preference is Vintage about 1920s to 1930s with of course modern conveniences. Something homey about a kitchen from that era. Baked pies, canned peaches, fried chicken, makes me think of a grandmas house……. My kitchen style is what I would call “Nancy’s Favorites”. I love French Country with some modern pieces as well as family antiques. Sleek and contemporary is all for me. Clean, cool, calm and collected. My ‘style’ would probably be described as Contemporary – it’s sleek without being ultra modern. I’m excited for YOU to be getting a real redo of your kitchen – I can certainly understand being over-the-top thrilled!!! Thanks for the chance to win the Gift Card!!!! Country French is my favorite. I love the colors and the warm feelings this style inspires. I also love The Graphics Fairy and Home Depot. Thanks for the chance to win the $1000. I really like a clean French country look, with warm wood touches. Wow, I would love to have my kitchen remodeled. I love the cabinets you picked out. I would probably go with a more white beadboard style. Thank you for the give away of the gift card. I ‘ve seen the Martha Stewart Line and love it, especially the farmhouse sink…..
What a wonderful blessing to be given new cabinets, Karen! They are going to look fabulous! I love that silestone that looks like marble. That may just work for our small kitchen. I would love to makeover our kitchen and give it some French Country style. I love your style and love Martha! Our kitchen is the absolute heartbeat of our home. A vintage-style kitchen with a wood floor, a big sink, subway tiles & marble-look granite counters would be my dream come dream. We’ve been planning our kitchen re-do for over a decade and I love what you’ve got underway. I love the clean look of slate blue and white with lots of storage that is easily accessed. Clutter-free counters and cool, sleek lines. I’m getting so excited for you. For sure a kitchen loaded with cottage charm! I am a lover of eclectic design and funky flea finds so I am a complete charming farmhouse type of person! My kitchen is bright yellow and very cheery but I detest my cabinets – ugly, badly painted white ickyness, so I would love, love, love an opportunity to re-do and add a farmhouse sink among other fab updates. The greys you chose are so lovely! Enjoy the transformation! You have wonderful taste. I’ve looked at some cabinet choices recently, and I think I prefer Country French/Cottage Style. Your color choices are to die for…complimentary to anything and everything. The flooring is my favorite. I LOVE your choices. I would say my favorite is Country French. We had Silestone counter tops put in a few years ago and LOVE them. I used to be in love with medium oak colored cabinets… but in the last couple of years, I have fallen in love with white… something kinda country elegance… does that make sense?! I love the choices you have made for your new kitchen and can’t wait to see the renovation process as you go along! Love your new kitchen choices! My fave. kitchen style is eclectic vs. contemporary- I love the look of stainless steel mixed w/ upcycled items and vintage pieces. Your new kitchen will be wondeful. We bought Silestone countertops from Home Depot a couple years ago and you will love them. They look like they were just installed yesterday! We put the color of wood you will have on your floor on the ceiling. Sounds strange, but it looks great. I love the old farmhouse look and feel, mixed with a little Texan of course. My fantasy kitchen would be farmhouse, with warm wood and a cozy color, maybe blue and yellow. Big porcelain sink with some pine and oak furniture. Wood floors, nice hanging light fixtures. How exciting to get a new kitchen- My DH made me new cabinets a couple of summers ago & I still love them. I tend to side with the French Country look. I know you can’t wait until it is all finished- Happy for you! I have been trying to remodle my kitchen myself for about 7 years. I live in a double wide mobile. The cabinets are not real wood. I have been painting them with a crackle paint . It is taking me so long because of all the steps. It is so time consuming. I can only work on it when I have a vacation. By the time I get the last part done, which is above and behind the fridge, It will need to be done all over again. My Hubby and I put a self stick floor down ( against his better judgement I must add ) to cover the white floor we had because we live in the woods and have so many cats we needed something darker. It is terrible all the seams have dirt and sand between them and are lifting. I am just in love with the farm house style I collect old kitchen things from the 30’s ,40’s and 50’s. They hang on the walls and on top of the cabinets. I have always dreamed of a wood look floor and country farmhouse cabinets. I love what you picked out except I have a real fondness for white cabinets. I guess because I grew up in the 50’s It brings me back to my childhood. Thanks for sharing your remodle with us. Can’t wait to se what you do next..
I’m very excited for you, getting a brand new kitchen. I wish I was! My dream kitchen would be farmhouse-cottage with wide plank old distressed wood floors, maybe some beadboard on the wall. Definitely real carrera marble counters and a hanging pot rack for my copper pots. Thanks for the opportunity to enter the drawing. I guess I am warm woodsy, because I like dark wood cabinets with copper sinks and hardware. design and I would not change a thing. You know what you are doing and this kitchen will be the center of your home, it looks very inviting. Thank you for sharing this project with us and all the woderful graphics…….. I hope you let us follow along with pics of your remodel. I’ve been gathering info about redoing my hopeless 80’s kitchen in lighter colors, and am just afraid to tackle the job alone! I lean towards French Country style, but will have to settle for keeping my icky 80’s cabinets. At least they’re still in excellent shape, just ugly! I am in LOVE with the cabinet doors in the pic just below the ones you picked, though! My dream kitchen is fancy cottage- antiques and high end appliances! I think it will look lovely!! I live in an apartment, so can’t do much but my kitchen is 1930s Canadianna. I would love to give this card to my friend who owns a wee house that truly needs a makeover. Her look would probably be vintage Canadianna too (think woodsy and Hudson Bay blankets and prairie colours). P. S. I used some of your old black and white wedding photos printed on a colour computer so that they became ‘sepia’ on coloured paper. I then hole-punched them, and used coloured ribbons to wrap them around serviettes on a table setting for a wedding shower. Everyone compared the pictures and they were good discussion starters. I had fun making them and I think the bride enjoyed them too!! Congratulations on the kitchen. We’ve been working on our new home since we closed a year ago and it’s fun and exhausting….Right now working on the dining room and other painting. Kitchen has 1994 wallpaper everywhere, Yikes! Oak cabinets I’ll have to live with them for a while, hubs said I could paint them. A gift card would be excellent. Your choices for your new kitchen will be gorgeous…My words for a kitchen are farmhouse meets coastal with clean lines and colorful…bring on the light. Can’t wait to see your end result. French Country! Oh, I hope I win! Love the choices you made for your kitchen. Good luck with your project and enjoy. I had to go to HD kitchen website to find the right words to describe what I like. I like country–French or otherwise. But I also found a couple of pictures they describe as Transitional that appealed to me. I guess I like an eclectic blend of this and that, with plenty of natural wood tones. Can’t wait to see your finished kitchen. How fun your new kitchen will be! I would want a farmhouse/cottage with an antique cupboard worked in. Thanks for the opportunity to enter. Beautiful,I really love the wood flooring you picked out!My kitchen is from the early 90s, I would so love to redo some things! I love warm colors.Would like to paint the walls a darker cream color like Latta and hightlight with some red.A tin Black splash not sure what color counters. I have my original would floors.My house is 100 yrs old & I love it.But kitchen is way outdated! Can’t wait to see your pictures when it is done! Congratulations on your kitchen remodel. Can’t wait to see it all finished. I Love the Farmhouse style. I think I would go with the white cabinets/ cupboards. Not sure what I like for countertops. Love the bead board back splash. And an old wooden floor. The wood would have to look old. How exciting !! WE are trying to redo our kitchen on a low budget. I love a mixture of Vintage 20’s and 30’s along with warm wood tone floors(love yours) , along with all the modern appliances. Our kitchen is very small in a 50’s ranch. Love my little house! Just have that one room to finish! I love a kitchen that is warm & cozy. A place to gather, French Country with a mixture of cabinet finishes & knobs and definitely choices that are easy to take care of. I love warm wood tones with a country feel. The kitchen is the hub of the home, so important! I love hardwood floors and cherry cabinets. My mom’s old cooking utensils, strainers and vintage accessories adorn my kitchen. The modern, organized looks are only on the inside of my cabinets and pantry. Love the double wastebasket idea! 1908 Craftsman with tons of pullouts inside doors for all my canning gear! I love a light, airy, warm, off white French Country Kitchen with a double sized stove, granite counter tops, open shelving to display some of my vintage heirloom dishes, high taupe brown wood & beam ceilings, light colored plank flooring, an island running through the center of the kitchen for friends and family together around – we always seem to gravitate to the kitchen, a friendly, inviting kitchen that I just can’t seem to spend enough time in. Congratulations on your kitchen, the floor samples and design looks absolutely lovely! I like sleek and contemporary. The modern designs with glass in the doors is nice, but then I think of all of my stuff looking out at me….probably not such a good idea there! I have never had the opportunity to purchase or design any kitchen cabinets and I think it would be hard as there are so many choices. The choices that you made are nice and I cannot wait for more information on the process. How long did it take you to choose this design? Congratulations on your kitchen re-do, Karen. My favorite style for a kitchen is late 18th-early 19th-century colonial. I love the deep colors like cranberry, black, mixed with tiger maple woods for a built-in hutch and shelves. Painted wood and stained wood can look so pretty together. A very primitive soap stone sink, cabinets custom built to encase the modern appliances, a wide board pine or hickory wood floor would complete the look. Sigh…. I love Country French and a mix of Farmhouse style. Love the Martha Stewart ones you picked out and can’t wait to see the finished project. How exciting to get a new kitchen. Thanks for a chance to win such a great gift at Home Depot. How exciting! Hubby and I are in the talking stages of redoing our kitchen. I want a mix of French Country with Americana Farmhouse. LOL What a combo! A complete kitchen renovation? How exciting for you! It will be wonderful to see the computer layout become a 3D reality. The process is kind of tedious, but you will enjoy the benefits for many years. And as I always say, “The kitchen is the heart of the house”. My favorite style is eclectic, but am leaning towards farmhouse. Have just purchased a house that is in dire need of some TLC. Currently the kitchen celebrates the glory (?) of the 1970’s. The walls are painted in a screaming bright yellow with a patina of grime, cat hair and other elements that are best left undefined. On the plus side, there’s skylights, room to expand and it’s a blank slate with infinite possibilities. Thanks for the opportunity. I enjoyed reading about your plans for a kitchen redo. We so need both a kitchen and a bathroom redo! It was really good to read that you liked what Home Depot has to offer, I always wonder who to go with for those type of projects, local or a place like Home Depot. I would say my favorite kitchen still would be contemporary with warm wood tones. Your new kitchen is going to be stellar!! I love the cabinetry you picked, and it will all go great together. I like the clean line cottage style the best! My style is sleek, ultra modern. Flat cabinet doors and straight lines. We try to keep visable accessories to a minimum too but storage is currently a problem. Current color scheme is white, black and gray with pops of turquoise. Great kitchen. I like contemporary and lots of wood for a cozy feel. How exciting to get a kitchen re-do. Good luck with the process. The word that best describes my favorite kitchen style: Mom’s. I love to be in my mom’s kitchen with her because it’s the heart of the family. I love everything that you picked out for your kitchen. How exciting. My kitchen really needs a ton of work. I do not know what the builder was thinking. seafoam green laminate counter tops edged in wood and faux wood cabinets. UGH! I sure could use that Home Depot gift card. I would say my kitchen style is Coastal cottage modern, with a touch of french glam! Right now the only word that I can think of to describe my favorite kitchen redo would be “NEW”! My 70’s kitchen is still waiting for it’s facelift. I do love a vintage flair, but don’t really think the 70’s are my idea of vintage. :-) Dreaming of the day where the dishwasher in my kitchen does not involve rubber gloves. I’m fortunate enough to live on the water – a small lake is still a lake! I love a combination of crisp nautical and lake cottage style – I’d love the beadboard cabinet doors like those that you chose for your cabinet color. We live in an older home and the kitchen is still in it’s original condition – we’ve just recently been talking about remodeling, so that $1000 gift card from Home Depot would be put to good use! I hope your remodel is everything you hope for! I really like multiple themes, but it would just depend on the rest of the home I was living in. Right now, I have a 50’s rambler and I think a more contemporary look would be most fitting. It’s fun to see you go through your process because we have been debating what type of flooring to put in our kitchen and what kind of new appliances to get lately. We still have the original appliances that came with our home and our home was built in ’56! Yeah! … talk about energy suckers. Good luck with your revamp, I hope it’s all smooth sailing for you. It seems like whenever we begin a project, we always run into some time consuming hiccup! Definitely contemporary. I love the color of your cabinets & the hardware also. Thanks so much for this chance. We’ve been looking at the renew option for our cabinets. We remodeled our kitchen about 10 years ago & I let my husband talk me into natural oak but I would really like darker wood with lighter granite counters. I love sophisticated cool tones but I think warm and homey would look better in my house. What a wonderful place to get help on designing a kitchen. Mr. Fairy is a design fairy at Home Depot, who knew. I would love a warm, huge, family style kitchen. Seems that is where everyone gathers. Large cabinets are a must to store all those large pans. I love country style that is the old farmhouse sink that is large. Can’t wait to see what you and Home Depot created when finished. Thanks Karen and Home Depot. What a wonderful look you have chosen! Martha certainly knows what she is doing and you can’t go wrong with her suggestions! My daughter and her fiance have recently moved into our home to say for their upcoming wedding. It has been so much fun to watch her in our kitchen paracticing her homemaking skills and sharing our space with her. Such a tresure to teach her all of my techniques and to share my recipe box with her as well! My dream kitchen would be French Country. I love to cook and to have a French Country kitchen would make me feel like Julia Child and perhaps then I could cook like her as well! I am very much into the French style but also love warm tones. I can’t wait to see your kitchen finished. I am sure it is going to be stunning. How exciting! My husband and I just yesterday started to look at new kitchens. I then realized, what a process! Counters, cabinets, backsplash, floors, style, color, ugh. I like so many different things. We have decided we are modern transitional…we think…or is it transitional with a slightly modern flair? I guess we will figure it out soon enough. Unlike you, you have done a wonderful job picking out your finishes. Have a super time with your remodel. Looking forward to your before & after’s. I love your selections in cabinet doors and found the farmhouse sink just wonderful. H.Depot and M. Stewart combined is a win win deal. Since I am in a very old farmhouse, country farm chic, warm and comforting, is my style! Your kitchen looks beautiful. I faux painted our countertops to look like Carrera marble. I Put 2 inch wide wood around cabinet doors to make them look farmhouse. I cut the top cabinet out in the middle and replaced with glass. My pendant lights are beautiful from habitat for humanity building supply. They are a thrift store find. I put mosaic tiles around the backsplash. And painted their walls a soft gray. There is a wonderful tutorial on YouTube about doing faux marble countertops. The ones I have look so real and were very inexpensive. They are holding up beautifully. I am so glad not to have the lime green countertops Formica that we had when we moved into this house. Want to see finished product! My kitchen is dark so I need light color cabinets too! I love your choices for your new kitchen. I would love to open our kitchen up and raise the ceiling to match the family room. I would use cottage white cabinets with matching fronts for the appliances, a farmhouse sink, and wood floors. I would also replace the lighting with pendants made of wire baskets and covered in canvas. I believe anything is possible if you want it and work hard to achieve it. The hard part is always convincing my husband to agree with me. I’m a French Country gal, but I also love your Martha Stewart. I’m so excited for you, Karen. You’re so lucky to get a new kitchen! We were going to redo ours but ended up having to redo our septic/sewer system. Priorities. Boo. I love warm wood but our kitchen is kind of dark so I would vote for the white Martha Stewart cabinets. I don’t like a lot of design – harder to keep clean! Thanks for the giveaway offer! I love remodeling! Your gonna have so much fun! My favorite is French Country. Hands down! I’ve recently repainted with tuscan colors and LOVE it!! Love the French Country look; my kitchen needs a pantry installed. Working on the design! MARTHA is the word that best describes my favorite Kitchen Style! I was so excited to see her new line at Home Depot. I have long drooled over her incredibly organized spaces and thought they were unattainable. This line really brings it within reach! I love the French Country style and am getting ready to paint my cabinets and some other pieces with chalk paint. We went with Martha Stewart closet re-do. We put them up ourself and love how they turned out. Love the kitchen cabinets. I’s say I’m definitely Shabby Chic! I just painted my old cabinets with chalkpaint white! Love them as the oak was so dark! I can’t wait to see your new kitchen! Kitchens are really the heart of the home! Oh. My. GOSH! I missed that you’re getting a new kitchen how? Kick me. It’s going to be absolutely stunning. And yes, the Martha name instils confidence for sure. It’s going to be fabulous. Your choices are perfection. I think the “looks” like Carrera is a good pick. Better to be able to use it and not worry! My kitchen dream words are: White. Cottage. Farmhouse. Functional. Eclectic and a little Rustic-Glam thrown in for Fun. Is Southern French Country a style?? If so, that’s me! Congrats on the kitchen make over!! That’s super cool! I’m very much a cottage / farmhouse kitchen kind of girl. Plate racks, glassed cabinet doors, and open shelves are for me. Your new kitchen looks GORGEOUS. We redid ours 30 years ago. Yup, that’s right YEARS ago. Definitely need some redoing and I would love to see it as Country French. Scandinavian-farmhouse style covers so much of what I like in kitchen design, that it is how I would describe my taste. I like a few industrial touches, and some very rustic in addition to “comfortable” elements and pale color washes in white/gray. The kitchen is one of the rooms we have not remodeled since moving into our home over 10 years ago. I absolutely hate it, and have been scouring the web looking for very inexpensive ways to give it a facelift. So far we’ve only removed the ugly fluorescent light and installed double schoolhouse lights. If I had a bigger budget, the ugly flooring would go immediately! Oh, you are so lucky to get all new cabinets! Love that you decided to go all out and do your floors and counters too! I love a white kitchen, with a mix of antiques and fun pieces! We live on a lake, so it is also important to bring the outside “in”. What I could do with $1000 from Home Depot! I love the French Country look! I love the whole look that you put together! Congrats on your new reno. I love the Old World Classic look – marble countertops and most of all, a huge and useful pantry! Thanks for offering the chance to win. Congrats on your new kitchen! Love the cabinets and floor! I like French country and warm woods! My dream kitchen would be light and airy with many shades of blue. A relaxing room where our Daughters, Son In Laws and Grandchildren could gather to make memories of happy occasions. Much like going and having a blast at the beach only without the sand! A true Florida beach kitchen. While I admire the more modern grays and silvers, I am definitely a warm browns/reds/ tans sort of girl. Wow so many kitchen choices! Shabby chic but Country Victorian too – can that be crossed? Ah well French Country. 250+ yo farm house kitchen – would love to have a new kitchen! We’re planning/preparing for our kitchen remodel! New appliances are in, they make the old counter and cabinets look ridiculous! I like a Warm Modern look, not stark but clean and simple! I love the breadboard look in a soft creamy white and add some cabinets with medium tone stained wood. I also love the marble look countertop but without the hassles of marble. I would love a new kitchen! Many people view Home Depot as a trusted venue for purchasing the nuts and bolts, plumbing, wood, paint, and landscape of their DIY lives without ever considering Home Depot as a sophisticated home interior remodeling destination for kitchen and bathroom design. If given the choice for a bathroom and/or kitchen remodel amongst a handyman/carpenter relying on my instructions, an interior designer with “visions of sugar plums and $ signs all in their head, or the experienced designers and craftsmen from Home Depot, I would most definitely choose Home Depot. How could I not.? It only makes dollars and “sense” to me. For our family, I would love a kitchen or bath remodel done by Home Depot because I know we would be more than pleased and excited with the results. Home Depot is a brand to be trusted. How fabulous and exciting! I love the old farmhouse styling, including the old wainscot…. I am SO looking forward to watching the process and seeing the wonderful final results!! Farmhouse all the way! I would buy all the items on my Home Depot wish list, so I could create, create, create! I’m new to your blog – came over from One Good Thing by Jillee – and I’m loving it so far! This kitchen you picked out is gorgeous… I sure wouldn’t change much if I were doing it. I love Americana, but lo love convenience too i.e. pull-outs, etc. I was furloughed this summer due to sequestration, so I really could use a start in remodeling! I love the sleek, elegant look of modern pieces and touches with a traditional edge. We have a 1930s colonial and I love to have an updated look while not steemrollering the overall tradition of the house. Old Fashioned but functional with great ovens for baking breads. I love your choice and will be following along to see the progress. I love clean lines and lots of light. And granite and stainless steel of course! Love your blog. And thank you for all the awesome freebies! I love a French country cottage style kitchen. French Country for me! I live in new construction so I got the cream colored cabinets and black granite of my dreams. The island is in a dark colored cabinet called espresso and I love the contrast. However . . . it did not come with knobs so I am trying to figure that part out now. I would like glass ones for the doors but am unsure what to do about the drawers – two knobs or something like the pulls you picked maybe? So even though my kitchen is newer – I could really use that HD gift card! I have so many projects and updates I want to make in my home. I live in new construction but love the character of an older home . . . Thanks and I love the choices you made – it’s going to be gorgeous! I can’t wait until the reveal! my kitchen would be Italian Country! Well at least that is what I would call it. With white cabinets and an island, but don’t know if I could even fit an island in the area my kitchen is in. Oh well, I can dream. The HD gift card would start me on the way to remodeling the kitchen. My favorite kitchen style is English Country kitchen, with butcher block and soapstone and exposed brick. Add re-purposed old wood flooring, a farmhouse sink and a lot of open shelving…ahhh, kitchen heaven!! I am THRILLED that you got your dream kitchen!! OMG! I bet you are dancing on air!! Congratulations to both you and Mr Fairy. I am looking into my Crystal Ball of Pipe Dreams and since you asked me, it is definitely French Country for me. In my Crystal Ball of Pipe Dreams is a long island in the center of the kitchen with shelving for cook books, Depression glass, my great granma’s Waterford vase and near the prep area is a glass fronted cabinet with a beautiful pediment above it to show off some Graphic Fairy graphics on canvas and my refrigerator would also have the same kind of French country wood paneled front on it. with more Graphic Fairy transfers. OK, time to get out of the Crystal Ball of Pipe Dreams, my brain can’t take anymore wishful thinking!!! Congrats to you! My hubby and I have started the renew/replace process for our 33 yr. old kitchen and dining room. After raising three children and a few dogs, it’s time to knock down the wall and make more room for family gatherings! We (well, my hubby lets a lot of the decor up to me) are leaning toward a cottage/Tuscan feel – don’t know how to explain it but I know what I need. I love, love, love the white style of cabinets you’ve chosen. I’ve been dreaming and looking at new white cabinets but need to sit down with planner. I know the stainless steel appliances I want along with the linen table runners, topiaries and burlap drapes to go with vintage white walls and a distressed white table with fabulous legs – the thought process is there. It’s amazing that at this time in my life I absolutely love my Home Depot charge as much as my Marshall’s/TJMaxx – between the three of them I’m in decorator heaven! Enjoy your new kitchen! First time here on your site. Loved the choices you made for your new kitchen. My style would be friendly eclectic cottage. Would love to win the gift card to be put toward new kitchen floors and some cabinet makeover. I really like the garbage/recycle pull out! Great idea! I can’t wait to see the final posting of your finished kitchen! I’m sure you will cook many fond memories in that lovely new kitchen! French Country. I do like lots of wood in different shades but have been steering towards French Country alot lately. I absolutely love what you are doing. The colors are great. I know it will be beautiful. I would have to say my style would be anything will help. lol. My cabinets are dated. I have gotten estimates to replace, now I just need money. My kitchen is dark , so I want light colored cabinets and black counters. I want to put in more drawers than I have now, so I can put my pots and pans in them and not have to get down on my hands and knees to get a pan that’s in the back of my cabinet. The $1,000 would really help me, but I want to thank you for the chance to win anyway. I can’t hardly stand it till you finish yours and post pictures for us to see. Congrats on the new kitchen. 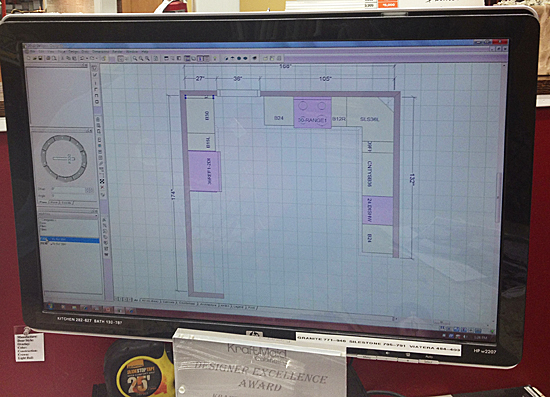 I have used the Home Depot, to design my new kitchen, and was thisclose …but a family emergency postponed the project. I picked the Martha Stewart line as well. More contemporary clean lines style here..
Congrats on your new kitchen! I am more of a French Country fan! I love my kitchen cabinets that I antiqued. They were hard work, but totally worth it! I would love to replace my countertops now. Thank you for the giveaway. i love modern and funky kitchens! i like funky track lighting and sleek counters and black appliances! we just replaced our old sink with a new shiny black one – its so awesome! <3 I love french country cottage style and 1940-50ish American glassware such as delphite, custard glass etc. Je taime GraphicsFairy for all your wonderful help in making my dream kitchen come true I have a remodeled 1940's barn and recently was able to put a floating floor called Vittners its a gorgeous aged wine cask looking floor. I love a warm yet light inviting feel because I truly believe the kitchen is the heart of the home. Oh my goodness, Karen! You must be on Cloud 9! What a beautiful kitchen plan! Congrats! I sure hope that you will chronicle this major event in photos and posts and of course, the final reveal! Have fun! My favorite dream kitchen style can be described as Updated French Country, Distressed, Industrial, Shabby, Inviting, Comfortable, Natural Light, Natural Finishes (wood floor, granite counters), Peaceful Gathering Place. I would love to have a beautiful Techno Kitchen with all the latest updates and advances to make my cooking life top notch! Can’t wait to see yours finished! Love all the cabinets in your new kitchen!!! What fun! I think I would go with french country… but who knows!! Oh Karen I love your new cabinets and the classic marble that you have chosen. I would say I am a traditional girl that leans towards vintage style. I love the dark tones of the wood floors that are available now days. Thanks for such a wonderful giveaway! Thank you, very much for all the wonderful graphics. I love to see your email full of great ideas, it’s wonderful. I know building your kitchen is a great thing. Cooking in it will be the best! I designed a kitchen in our last house and will do it again. “There’s no place like home”, when you design it yourself! When I moved into my house 15 years ago, all it had was an old aluminum kitchen unit that was rusting and falling apart. I ripped it out and gutted the kitchen in hopes of putting in new cabinets similar to the ones you just selected. Unfortunately, they didn't fit into the budget, so my kitchen became an eclectic mixture of vintage pieces. I found a vintage 6-burner stove from the 50s, a cast-iron and porcelain farm sink with pedestal legs, the bottom section of a hoosier cabinet, a large oak hanging cabinet with glass doors, and two free-standing cupboards with glass doors. While I love my creative re-use, I've always dreamed of having a newer farm sink (preferably without rust lol) and lower cabinets for storage, since most of my dishes still reside in a cabinet in the basement! Thank you for sharing all of your wonderful vintage graphics with us! I’m a huge country french fan! i absolutely love it! French country is definitely my favorite. So pretty! Congrats on the new kitchen, its beautiful! I think I would describe my style as contemporary, I really like sleek lines. We upgraded our countertops with Silestone from the Home Depot about 2 years ago and I really love them. Look great and so easy to maintain! Would love to replace our old ceramic tile with some beautiful wide panel wood flooring (love your choice, too). Of course, then we’d need to redo the cabinets. And then we might as well refugee the entire kitchen. Additional lights, stainless appliances… And so it goes! * reconfigure! not refugee – it’s not that desolate looking! I love the shaker look, but with some sparkle. My kitchen is old and from the 1950’s, some day I hope to update it. Thanks for the info on Home Depot! I love what you’ve done here, but I love the look of real wood in a cabinet. I’ve loved the Shaker style that is similar to what you’ve done, but would love hickory or some other interesting, rich wood. The kitchen you’ve planned will be so beautiful once you’ve competed it, though. All the light cabinets and the drama of the dark counters! Can’t wait to see how that turns out! I love sleek and contemporary. I really love the black granite that you’ve selected for the counter-tops. So pretty! I LOVE farmhouse country and would love to transform my kitchen if I won!! I love the things you picked out for your kitchen and think it will be beautiful when it is finished!!! My style is Farmhouse. Since we live on a farm, that seems appropriate. I like simple clean lines and I think the choices you’ve made a beautiful. What fun you must be having! Congratulations on your new kitchen! And thank you for the chance to win! It’s amazing how we all need certain colors and textures to acheive the balance we’re looking for. Me, I can’t go with even one dark color. I decorated our home with dark colors and plantation blinds. I wondered why I always felt such a heaviness when I walked throughout the house. I, also, wondered why I didn’t feel quite happy in it. It felt out of balance. I got rid of the plantation blinds and that’s when I realized the heaviness that they were adding to each room. I repainted our walls with extremly light colors that are cheerful, to me. I can’t tell you the difference it has made in how I feel in our home. Everything is light and bright. I can’t do stainless still appliances, either. When I walk into a kitchen full of stainless steel appliances I feel as though I’m walking into a morgue. They really depress me. I apologize for the length of my post. I wanted to share how colors and textures can effect our mood. I love sleek meets farmhouse! I’m a modern, sleek kind of girl. Clean lines, silver door pulls, wood drawers. Love it! Hi me again:)….from the previous post….Now that I think about it, it speaks well of Martha Stewart (An American designer) and Home Depot that you could put their cabinets in an IKEA kitchen and be able to go nose to nose with Scandinavian designers. Even the drawer pulls you chose are the same in our kitchen…. I’m conflicted! First of all, your kitchen choices are fabulous! My hubby forbids painted wood. I like both stained and painted so I’m torn. I’m both traditional and transitional with some contemporary touches, but not modern. It has to feel homey to me. We are doing our reno in phases and would totally use that gift card in no time flat! I actually picked out the same Martha Stewart pulls for my drawers when I repainted all the cabinetry recently! LOVE them! Good choice!! 😉 Great minds, right? I’m LOVING that Silestone in Lyra…will have to check that out for the rest of my kitchen remodel. I would describe my style as French Country Coastal Eclectic with a touch of Vintage charm….along with warm wood tones mixed with whites for contrast and a bit of color thrown in for fun! Looking forward to the finished photos! LOVE your choices Karen! And yep, gotta go through the kitchen section to daydream. I’m planning on starting our kitchen makeover this fall and my maple cabinets are going from maple and white and bright! Love all your choices… can’t go wrong with Martha! I love simple, plain kitchens with silstone counter tops. I think a combination of contemporary, cozy and creative describe my ideal kitchen. I like clean lines and pretty square corners where they count (cabinets), but I like to bring in the cozy with accessories and the creative with unexpected elements (color, tile shape, etc.). A kitchen with the lingering glow from a red brick pizza oven flowing on the face of the people around a table polished from years of elbows after dinner, with warm dark wood floors and hammered glass fronted cabinets is my preference. It would be a kitchen to safely gather in all those I love for rest and companionship after a long day in the world outside. Love the cabinets you picked out! I would probably choose something similar. Love the farmhouse style.My dream kitchen would have white cabinets with a dark granite counter and at least one cabinet with glass doors for the fancy dishes. Definitely hardwood floors (espresso color) and an island with seating. Perfect! Love what you’re doing in your kitchen!! We live in a 160 year old farmhouse, so what you are doing is also perfect for our home! I have a lot of collections to display, too!! I love the choices you made for the new kitchen space-woot-how exciting! I think I would choose farmhouse style if I had to choose one….with touches of some modern materials for some pizzazz!! 🙂 Thank you! Fabulous and organized! Everything in its place, functional, and yet leaves room for decor! We moved into a 60’s house and I have been wanting to update the kitchen. I painted the cabinets and removed some doors, added baskets, but…. You know, it just doesn’t quite make it. Your update gives me lots of ideas. I am closing on a new home on Friday! When I say “new” home, it is actually an old home. Fixer upper as they say. The kitchen has one old built in cupboard that I love and not much else going for it…doesn’t even have a place to put a table! I plan to go with a style that is retro/industrial/warm…what style would you call that? Eclectic for sure. I am still a fan of the shaker style cabinets. We installed these in our kitchen in California 12 years ago and then had to move out so I never got to fully enjoy them. Out there we did them in cherry and they came from Home Depot! 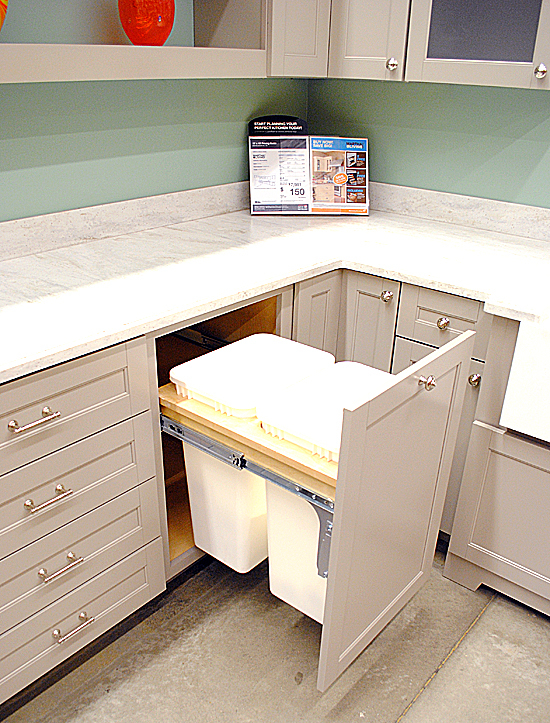 We were also the first people in the Torrance area that used Silestone from Home Depot. In my current half remodeled kitchen I would choose shaker style again. But possibly in a painted warm white finish. I’m planning on remodeling my 18 year old kitchen next spring and am going from light oak to white cottage style with soapstone counter tops. Can’t wait to get started on it. Warm, Cozy, Inviting. (Self-Cleaning is nice too). Love the Martha Stewart products! I would love something country, but modern, and nice light gray or white with brushed nickel hardware! I love the warm old world feel of dark cabinets with a heavy dose of crown moulding on top! I would love to switch out my old corian counter tops for some heavenly granite. My ideal kitchen style is something that is “timeless” in nature. The last thing I want is for people that walk through my house (if I ever list it) to go “yuck, that kitchen looks like it’s from the 70’s, 80’s, 90’s, etc. – it’s going to need a huge remodel.” That’s why I tend to stay away from styles that are modern or trendy… I also tend to lean toward furniture & cabinetry with simple lines – like shaker style, with matching wooden knobs. I also like incorporating reclaimed wood (from a barn or what not) … maybe to be used in flooring or as ceiling beams. I love wide-board floors with pumpkin-pine colored stain (similar to orange shellac), and if painting I like the idea of using milk paint. I also like the country primitive look, and often incorporate glass ball jars & elements from outside (pine or cedar branches, twig wreaths, pinecones, berries & what not) as accents around my rooms. When we are able to do our remodel, if I don’t go with wood flooring to match the rest of the house (there’s 2 types of flooring in my kitchen!) I plan to use soapstone tiles. My husband & I are also thinking of doing a soapstone countertop (and possibly sink) since soapstone is non-porous and ages to a beautiful charcoal color. My god!! –you’ve finally given me much-needed hope! I’ve felt so helpless in my 1914 bungalow, since my divorce. Your pics are empowering!! Many thanks! I like warm oak cabinets and stainless steel appliances. As a Food Historian, my tastes are a bit unique- I prefer the rustic look, compatible with a fully functional wood stove that has a bake oven. If there was a way I could be transported back to 1913, I would go without hesitation, at least then, we had adults running our country. I like a combination of warm wood tones and a bit contempory. This is beautiful! For myself, I’m a bit traditional. I like a clean country style, my little kitchen SO needs new cabinets. My style is Ultra Modern! The funkier the better! I love a warm, inviting kitchen feel so that family and friends feel comfortable. I love warm wood colors and stainless steel appliances with marble or granite countertops. My dream kitchen would be bright, colorful,clean, functional and comfortable! Our kitchen style is modern. We like a nice clean look. I absolutely love retro kitchens. The ones with black and white tile floors and red walls. I love your remodel, it’s just beautiful. I prefer something contemporary, but not too trendy, I want to be able to live with it for a long time without it looking dated. A little bit country , a little bit rock and roll ! I like a sleek contemporary look. I’m glad to hear you like your Silestone counter tops. I’d love to replace mine with that. Thanks for all the pictures! Love Martha’s stuff. I must say I like the contemporary style the best! Warm wood would be our preference – I like cherry. We’re starting to look at our options in renovating the kitchen. I like modern kitchens that have all the amenities. I like a traditional country sort of look. I like warm wood tones. We just redid our kitchen. I went with cabinets with almost exactly the same door style as yours, but in golden cherry. The floors are vinyl tile that looks like slate and the countertops are quartz that mimics granite and pale beige ceramic backsplash. Our house is 100 years old and I wanted something that looked like it belonged here all along. I prefer wood/homey/farmhouse style. I like sleek and modern. I would love stainless steel countertops and glass in my kitchen. french country is my wifes favorite style. I tend to like modern. I love your choices, my dream kitchen would be farmhouse style but with all the modern conveniences. French Country all the way! How exciting to watch you pick out your new kitchen! It makes my heart warm to see others blessed!! I would describe a kitchen that I would love as simple design with a slight French country cottage and pinch coastal look. I would love to win the gift card for Home Depot. We just moved into this house a year ago and updating the kitchen is one of my next projects!! Thank you. I can find soooo much there to make my home Dazzle! I’m an eclectic bohemian artistic kinda gal… is that a style? I would be ecstatic with a kitchen without grout…lol. Tile counter and floor… uggh. Congrats on your new kitchen. I am super jealous. I love everything that you picked out. I would like a baker’s kitchen with marble counters to roll out dough and a huge oven! The Martha Stewart cabinetry looks awesome! I love the warm wood tones for a kitchen. Your’s looks great!! I know! I picked just about everything you did! Immediately draw to the Martha kitchen. I WANT THAT!!! 🙂 Only on my wish list though, waiting to be able to afford this. PS- thanks Home Depot for always letting me bring in my 9 year old English Springer Spaniel. She LOVES to shop the Depot! Definitely Comfortable Country. I’m trying to work up the nerve to paint all my oak cabinets but need a firm overall plan first. Warm wood tones is the choice for me in my house. Wow, I think you made great choices!!!! Of course I’ve coveted Martha Stewart Kitchens everything since they first came out. I LOVE Ox Hill with Beach Sand color. I think of Ox Hill as farmhouse with a touch of crisp contemporary to it. Narrowed down the countertop to 3 , Arcadia, Shoreline or Laurel Branch (love the name of this, : ) Our kitchen is the last of our rooms that needs to be tackled. We’ve lived in our house for 20 yrs, and at the time I had a 7 year plan on remodeling when we moved in. Oops, better late than never right?? Congratulations on your new kitchen, Enjoy!!!! Thank you for sharing. I love a clean contemporary look, especially with horizontal style upper cabinets. I love what will be your new kitchen.. I love the French country look. Im getting ready to do a kitchen remodel myself and are undecided with everything. I truly love your kitchen choice. 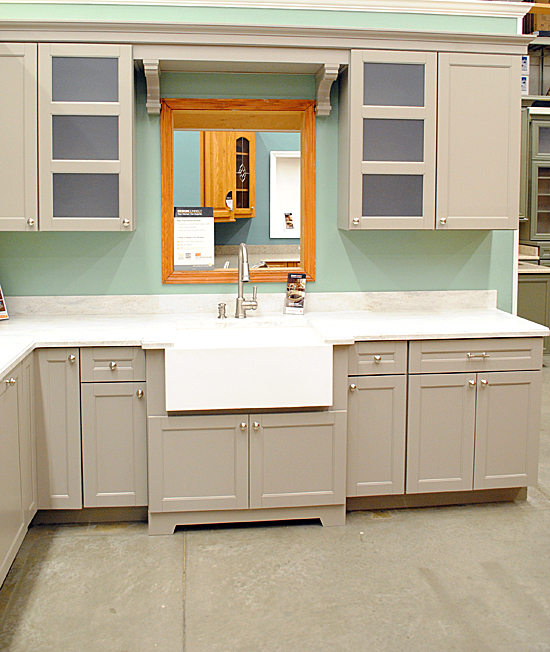 The sink, built-ins, cabinet and color choices..perfect!! Right along the lines of what I would choose for my own. I tend to always gravitate towards country french. I like sleek and contemporary at times and warm wood at other times. I’m not a fan of white kitchens, so contemporary goes out the window for that color! With a pop of colour in a vintage robins egg blue 50s style refrigerator ! I love the look of the new kitchen! I would have to say my favorite kitchen style is retro/vintage with a lot of red and aqua accents. I also like farmhouse/country style too so my kitchen currently is an eclectic mix of both. I love any style of kitchen that has personality and looks like it is actually used, however. Shaker cherry cabinets and soapstone! Wish I could replicate this dream kitchen of yours. Planning on a kitchen re- do but it has been put on hold as my hubby was laid off last month. I have been drooling over the Martha Stewart line from Home Depot And I have a file with all the cabinets and sources for the lighting, stools, etc. Oh to win the prize! PS- also love the Graphic’s Fairy post of the Thanksgiving images. 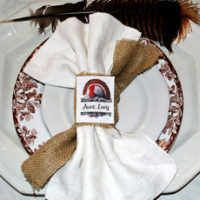 I make place cards every year from your site! Just got cabinets from home depot for my tiny cabin redo. They were great to work with. I love the farmers sink you put in. Kitchen looks wonderful only hope my redo will look half as good when it eventually gets done….one step at a time. I love country & vintage styles. Clean, bright colors, and wood tones! Lovely choices! Hi! Thanks for the chance to win a gift certificate!!! I would pick the warm/woodsy for the kitchen. Actually if I were to win(so, so hoping) I would use to help my mom redo her kitchen, which needs a redo badly!! 😀 This would be a wonderful surprise for her. How exciting to have a new kitchen. I love my Shaker Style cabinets in an off white to brighten up the frequent cloudy days we get. I love the warmer woods and granites! I love French Country, really like the Martha stewart cabinets you chose-very chic! My style really is very eclectic and its sometimes difficult to blend the different syles I like..
French Country would describe my style. Also, I love the colors of blue and yellow together in a kitchen. I would like really dark hardwood and cabinets. And amber glass for the kitchen cabinets and amber lighting underneath the cabinets. Gotta have a tall kitchen island big enough to have a few stools around. Nice dark granite with specks of gold in it. Black colored appliances. French Country for sure! A farmhouse to remodel is my dream! Beautiful kitchen—enjoy! I like a lighter kitchen. I just had new kitchen floors put in and they are a light gray. My cabinets still are a drab brown and need a face lift. My counter tops are even worse. I would go with a light traditional style. I love the French Country with a touch of Industrial…if that makes sense. We (I mostly) are redoing an old house where I just finished putting insulation board and foam in the exterior walls of the new kitchen area. We stripped all lath and plaster and need to run the electric now. i am planning a country farmhouse/ french country design, using some of the things I’ve gathered over the years. Sure would love to have a kitchen before Christmas! You are such an inspiration for me! How exciting! I am a French country gal and that gray as showed in your pictures would be divine! We have the traditional medium honey oak cabinets and trim throughout our house…drives me nuts! I’m so ready for a makeover myself. Can’t wait to see when you’re done. Love your choices. They are what I would pick. White cabinets, marble or black granite and hardwood floors with some industrial touches. Love your choices…esp. color. My style is French Country/Farm House. OMG…What I wouldn’t do for new kitchen cabinets in a french country, after buying a remodeled manufactured home (by a DIY guy), I was standing in the kitchen and noticed that all the cabinets don’t match, some of the cupboard doors are totally flat and others have trim on them, THERE ARE 3 DIFFERENT STYLES, I guess I was too excited buying my own home for the first time all by myself, I didn’t even notice. Either way, I still love my home and am very proud! We live in the farmhouse my husband’s grandparents built in 1897, so I suppose my style could be described as country chic with a touch of French country. We are currently replacing the back walls (out of necessity) and will be redoing the kitchen and a bathroom as a result. I would love to have a kitchen that was style appropriate to the age of the house while still being functional for today’s living. I would definitely pick the Lyra Silestone you chose, hardwood floors and vintage style lighting. My husband prefers wood cabinets over painted, so a warm cherry color in the style you picked would be perfect and coordinate with the original woodwork. Congratulations on your newly remodeled kitchen. I cant wait to see photos of the end result. If I were fortunate to win a $1000.00 kitchen makeover I think I would go for a cottage/french country look. Right now my kitchen looks like a sad mess. I am embarassed to say that my stove I bought for a hundred bucks used when I got married32 years ago, so I would probably replace it and reface my cabinets and counters. Love the cabinets you picked out. I just live French country style. Love the Martha’s! My favorite style is vintage 1940’s with lots of red! I love Country Cottage style Rustic, Vinatge, English Ivy pots, clean and Apple Décor. I keep things pretty contemporary. But I sure do love the country look. I love dreaming of a new remodeled country kitchen in my cottage kitchen. I want to replace my pressed oak cabinets with the farmhouse cabinets with white upper cabinets and gray green lower. I would like some of the special pull outs. I’m dreaming of a new kitchen from Santa. I love something clean and open as I live near the sea and my space is small. So while I want the full capacity of a big kitchen, I on ly have 56 square feet. So you can imagine. I like a traditional french country kitchen with warm woods. I also like my kitchen to be open where I can see everything I need. I hope you didn’t go for the black granite counters. They show EVERY crumb. My parents have them and can’t stand them. I like that silestone color a lot. We have just redone our bathroom in a grey/beige marble that I’m in love with. I like a more eclectic/modern/rustic look…if there is such a thing!! definitely ecclectic. Im not modern at all. I like stained concrete counter tops, wood floors. white cabinets. More of a cottage with industrial mixed in. I love the sleek & contemporary! So jealous, I rent and my kitchen is straight out of 1971. Yuck!! I would gladly share some of this money to update it for my landlords, they are fantastic people. congrats to your win 🙂 Im still working on updating my husbands grand parents kitchen and house, interesting how they build back then… LOVE IT SLEEK AND VINTAGE AND LIGHT COLORS SO IT ALWAYS LOOKS INVITING AND BRIGHT:)))and sure could use some help……. :)))))) here is a german saying i was gifted too on a cutting board when i was 17 ( lol ) for ur kitchen maybe? I love warm and shabby. mixed materials; concrete,metal,stone, wood, painted distressed. Easy to clean, durable. Something that pops or a focal point. lots of seating and open. Lastly, tons and tons of storage! Our kitchen is seriously the heartbeat of our home. My style would be classified as cozy & eclectic. Our cabinets are made from the cherry trees that came down when our lot was cleared. The walls are a variation of sage green, ceilings are robins egg blue, the counters are black (I LOVE them), the floors are acid stained concrete, and it all complements our claret AGA stove. Your kitchen choices look Amazing! Lucky You! I also love the look of carrera marble, great choice! As far as my Style… I would call it Chic Coastal Cottage :-). What beautiful choices you’ve made! I’m envious of that double trash bin! I’m a fan of farmhouse kitchens with lots of natural light. They’re made cozy and warm by the love and laughter of family and friends. Enjoy your new kitchen! I love the Country French! Love your cabinets! Home Depot rocks! I love your cabinet choice! If I were choosing for myself, I would pick something very similar, especially the color gray. I like a clean, organized kitchen that is something in between Country French and Farmhouse style. Your kitchen looks great! I’ve been dying to change the color of my cabinets. They are just builders stock honey oak color. I hate them! I’ve been debating between white or dark walnut. I love dark tones but love the white cabinet look too! I guess for my style, I’m between them all! Lol. I do love dark tones though and like a little mix of all styles. Beautiful !Love your style ! Love your blog!! Congrats! Love the Country French …. I love seeing the process for this! My husband and I are buying our first house and its move in ready but…..the kitchen cabinets are those horrid white laminate with wood trim…so 80’s. I love the cabinets you chose, I’m hoping in a few years we can do all new cabinets. My dream kitchen is causal elegance, a warm white from the cabinets to the counter-tops and stainless steel appliances. I love Sleek and Modern! I’m all about simplicity! I like sleek and contemporary and marble. I love everything that you picked out, especially the counter top. We have to replace our formica and now I will go to Home Depot and check out what you have posted. Thanks so much for sharing your remodel. My current style is blah, but I really, really want a Rustic French Country kitchen. My current kitchen is minimalist and sleek but I would love a rustic villa look. It’s warmer, cozier and more inviting. Thanks for the chance! I would revamp my storage solutions for appliances and my pantry! I like the warm wood in a fairly sleek style, with plenty of storage and really nice appliances. Although the very contemporary styles are probably easy to keep clean, they seem rather cold to me. Oh, Karen, how wonderful for you! I absolutely love the beautiful Martha Stewart cabinets you chose. They are so perfect in every way. If I had the choice, they are exactly what I would choose. So simple, elegant, and gorgeous. Lucky you! I tend to gravitate towards the craftsman style. It gives the kitchen a great classic feel. I love the French Country look, but in our tiny 50’s condo it wouldn’t work. I think mid century modern / contemporary is the only way to go here . I wish we had a big farmhouse type kitchen. Congrats on your remodel! I would love to do ours! I would start with the countertops – we have a blah colored Formica – and move on to the floors! About 6 years ago, we renovated our joriginal 70s kitchen with orange cabinets and faux brick linoleum into a tradition kitchen with textured cherry cabinets and warm ceramic tile. We love it! We also have the garbage/recycling can inside of a cabinet and absolutely adore it. It is so convenient! I love it when visitors ask me where my trashcan is because they are always surprised. Love your new kitchen! I love a modern/traditional mix with updated fixtures and classic clean white cabinets. Would LOVE to update our yellow brick roam ceramic tile floor. I like the French country look, with hanging everything! wood floors and stucco looking walls. Wide open WARM Country style kitchen with window and flowers. A huge fridge and hardwood floors. That would be the perfect kitchen for me. My favorite kitchen style is and will always be sleek and contemporary. If I may coin a phrase, the words “hyper modern” would describe how I would design a kitchen, had I Carte Blanche. I definitely like sleek and contemporary! I would love a French Country kitchen !!!!!!!!!! My kitchen is more traditional. What a Fun giveaway. Thanks. I love you new kitchen. I would say I like French Country design for the kitchen. Warm and inviting,and comfortable, with a rustic feel. The kitchen, after all, is the heart of the home. I love your new kitchen. I would say that I like French Country style for a kitchen. Warm, comfortable and inviting. After all, the kitchen is the heart of a home. I love a country kitchen with with a floral wallpaper. <3 "vintage industrial", cottage, rustic..
My best description of my favoirte style for a kitchen is craftsman style. Dark woods quarter saw oaks. Love the Fench County look! I am sort of a dichotomy with my tastes. I love rustic, earthy, natural styles and I love ultra modern. One of my fav styles is known as urban farm. Its a mash-up of ultra modern industrial stuffs with natural stuffs. I am so jealous of your kitchen makeover! That is on my wish list for the coming year. I like rustic or farmhouse style kitchens with a preference for warm tones, darker woods and bold colors for accents. I like a sleek and contemporary kitchen but not too modern -looking! It would have to be a cross between old country and Italian. Lots of natural wood, marble and ceramic tiles. I want LG appliances especially the refrigerator. Ceramic tiles for the floor, granite for the counter tops. I am thinking some type of tile for the splash guard. The faucets will be the best technology has to offer. I am not sure there is a name for my favorite kitchen style. I like plain, simple and efficient but still warm and cozy. Sort of like the cottage look but with no clutter. I really like the french country look! I sooooo need a kitchen redo! My 1948 cabinets are really showing their age. I love a cottage farmhouse style. Love the Martha Stewart Line. My kitchen style would be french country, I love the country look cabinets. My style is a very classic but simple craftsman style. I want straight lines everywhere, no curves or angles. I like dark red stained oak, concrete, natural slate and green earthy colors. Thank you! I like wood, mostly medium color. I hate stainless steel appliances, I like black appliances. We loves the options at Home Depot for kitchen design. Loved the Ox Hill but ended up moving towards warm and woodsy. It just worked better with our budget. I love the country farmhouse style kitchens with nice rustic tones and accents. Bright, airy and colorful. My dream wish list for my kitchen would include french doors leading outside (which would let in a ton of light!) and a gas stove (currently have electric). My favorite kitchen style is modern, bright and fun. My idea of the perfect kitchen changes every time a see a wonderful new design. I may never make a permanent decision! I love the country French look, but your choice is beautiful. I’d like to get a new wood floor and new counter tops. 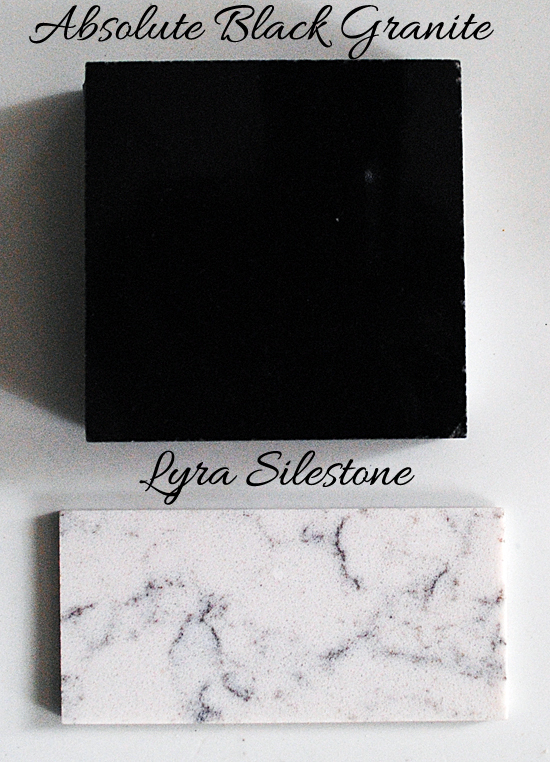 I love the Silestone in Lyra that you have chosen. I am the warm and woodsy type by the looks of it – happy holidays. I am not sure what my design style is because I am very challenged in that area! I love a clean look without clutter, so it has to be simple but I do love the French Country look as well! I love the Warm Wood tones, big and airy. Your kitchen is really looking gorgeous. I like mix & match, hodge-podge, and a little bit of this ‘n that! Thanks for the chance to win! My husband would give his “right arm” for a large, modern gas stove! Thanks for the chance! I like the comfy style of shabby sheak…. not sure how I’d go about it, but I really love comfort for all! We have the cheap flooring that looks like wood but is coming up especially where our dishwasher leaked and someday I would like to replace it with real wood flooring . I would also like a new dishwasher and frig someday. Wood tones are great but, don’t suit my budget. my favorite is French Country! The words I would choose would be Organized, Modern, Sleek, and Clean. My wife likes classic wood tones. She likes lots of wood for cabinets. i prefer the country look myself..usually a darker wood. we live in a rental now and ick the plastic veneer is horrible. i guess some paint and accessories would do the trick..
My favorite kitchen style is chic country. I imagine my kitchen having a farm sink, built in fridge, and dark brown wood flooring. I like something that’s modern but also warm. Clean and contemporary. We need new cabinets badly though! I like modern kitchens with a country touch. first of all congrats on your kitchen.. looks amazing! I would enjoy the more modern look personally. I’m not doctrinaire when it comes to kitchen styles, but like to mix and match styles to my own aesthetic values. It’s sort of like a Bruce Lee Jeet Kune Do philosophy of kitchen styles. I take the “best” of each category for a mixture of styles that appeal to me and I put them all together in the context of an attractive kitchen (that I like). I like warm wood and stone products on the walls and floors…natural products. But I want a French door fridge and a farmhouse style sink. Warm and organized. Not fussy. I love country style kitchens. So warm and inviting! I like a country look with white cabinets. My kitchen needs a renovation. I prefer warm wood tones in the kitchen! I gravitate more towards warm, earthy tones, country kitchen that’s modern, but not sterile. Vintage and bright. I already have the floor picked out but am working on the rest of the plan for our kitchen. Our house is 100 years old with worn 80’s remodel that needs updated badly!